Interruption of schistosomiasis transmission has occurred in multiple countries but it has never been attempted in a sub-Saharan African country; until now. The archipelago of Zanzibar, set in the Indian Ocean with its beautiful beaches and azure-blue waters, is a travel agencies marketing dream. Stone Town, on the island of Unguja (known as Zanzibar Island) documents its cultural history through the fascinating architecture, museums and now famous Mercury House (Freddie Mercury’s birthplace). Outside of Stone Town and in the rural non-tourist areas of Unguja and its sister island Pemba, the Zanzibar Neglected Tropical Diseases Control Programme (ZNTDCP) has made great strides in controlling S. haematobium infections, the causative agent of urogenital schistosomiasis, a chronic and debilitating Neglected Tropical Disease (NTD). Currently it is implementing a project of paramount interest and importance in the global efforts to control this particular NTD. 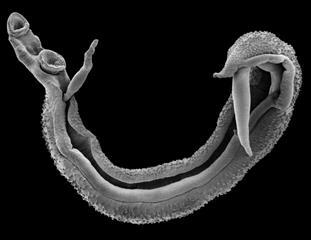 Urogenital schistosomiasis is caused by infection with the Schistosoma haematobium trematode. This trematode resides in the venous plexus blood systems. The eggs produced by the schistosome worm pairs must pierce the venous system in order to be released into the environment through urine. Once the eggs reach fresh water they hatch out into their larval stage and infect the intermediate host, an aquatic pulmonate snail of the Bulinus genus. Initial symptoms of the disease are largely due to the eggs piercing the blood-urinary tract barrier. Children, the most prone to infection, suffer from anaemia, fatigue, painful urination and blood in urine. The chronic and severe aspect of the disease is caused by the eggs that do not make it out of their host. A large amount of eggs get washed by the blood system into the human hosts’ organs where the various proteases and antigens on their surface trigger an inflammatory immune response leading to granuloma formation around the egg. This can lead to a variety of serious health issues in adulthood. Thankfully, by Merck KGaA are donating Praziquantel, the only safe and effective anti-schistosomal drug, via national control programmes aiming to reduce schistosomiasis to the point where it is not a public health problem (less than 1% heavy infections in at risk communities). Strong political and financial commitment by governments and aid organisations are required for schistosomiasis control programmes. But this disease control strategy is not enough to stop transmission. Currently we have a significant understanding of the biology and epidemiology of schistosomiasis and we may even have the tools to achieve transmission interruption. Dr David Rollinson and colleagues published a review on the current tools, strategies and requirements for schistosomiasis transmission control, calling for the development of an agenda on schistosomiasis elimination. As the review highlights, interruption of schistosomiasis transmission has occurred in multiple countries but it has never been attempted in a sub-Saharan African country; until now. The Natural History Museum’s schistosomiasis research group, together with the Zanzibar Ministry of Health, Swiss Tropical & Public Health Institute (Swiss TPH) and the Schistosomiasis Control Initiative are working on an exciting and ambitious project to determine the feasibility of urogenital schistosomiasis elimination as a long term goal for schistosomiasis control programmes in sub-Saharan African countries. The Zanzibar Elimination of Schistosomiasis Transmission (ZEST) project, was launched in July 2011 and is being funded by the Schistosomiasis Consortium for Operational Research and Evaluation (SCORE – University of Georgia) set up to tackle the challenges faced by public health programme managers trying to reduce schistosomiasis in their areas. Its geographical location. As an archipelago off the coast of Tanzania, transmission and treatment could be monitored closely. Its history of continued disease control efforts. At baseline the prevalence of schistosomiasis on Unguja Island was as low as 3% in school-aged children. The detailed information available on the aquatic snail species responsible for the disease on Unguja and Pemba. By comparing and closely monitoring the outcome of differential intervention arms, the ZEST project aims to develop an evidence-based strategy for elimination of urogenital schistosomiasis in an endemic sub-Saharan African country. Eliminate schistosomiasis as public health problem in Unguja in three years, interrupt transmission in 5 years. Control schistosomiasis in Pemba in 3 years and eliminate it as a public health problem in 5 years. There have been 6 rounds of treatment since 2012. Drug compliance improved when treatments were distributed to children via schools instead of via local health distributers. At schools children receive their treatment with porridge making it more likely that they will swallow the drug. Bulinus globosus snails were found in half of the surveyed water bodies on Unguja and Pemba. These water bodies were sprayed with Niclosamide, a safe, biodegradable molluscicide donated by Bayer AG, at least once each year to reduce the host snail population. Led by behaviour research scientist Bobbie Person, the Zest behavioural team have set up special schistosomiasis awareness days in public and religious (madrasssa) schools and have helped communities design and install their own urinals and safe washing platforms. There have been a few challenges developing, some predicted some unexpected. The impact of migration has long been a challenge for the sustainability of schistosomiasis elimination; this is something that needs to be addressed by the Zanzibar government. The Zanzibar Elimination of Schistosomiasis Transmission project is currently in its 4th year. The ZEST team is working around the clock to collect, clean and analyse the latest data as well as ensuring the successful continuation of the project. Once they have finished I’m sure we can look forward to exciting publications. Till then, fingers-crossed!